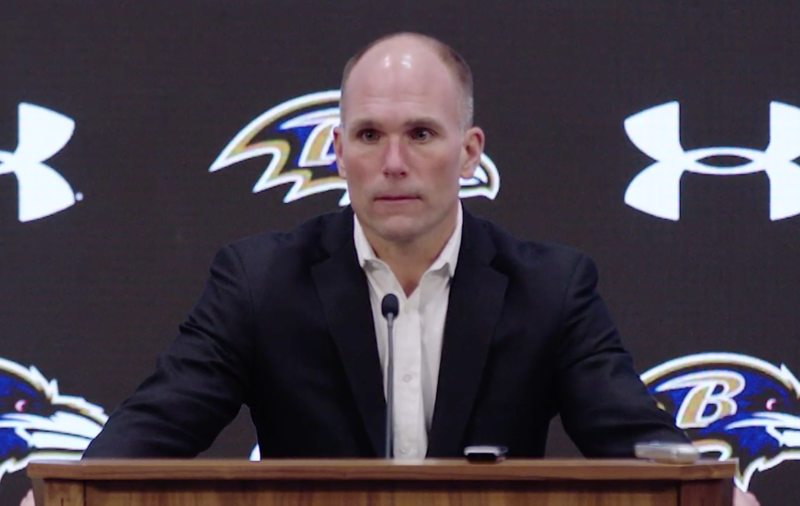 On Wednesday, Ravens General Manager Eric DeCosta spoke to the media for the first time since assuming his new position. DeCosta takes over for Ozzie Newsome, who is taking a step back in the organization. As Newsome’s longtime deputy, DeCosta made the transition to a new general manager easy. He has been ingrained in the organization since the days of Ted Marchibroda and knows the pressure and expectations that come with being a Raven. While most expect DeCosta to maintain the status quo and continue the Ravens down the path that Ozzie Newsome charted, DeCosta expressed his intent to put his own stamp on the organization. General Manager Eric DeCosta implied that analytics will be something that the team will give an increased role. When asked about his vision for the Baltimore Ravens, DeCosta mentioned that he wants his staff to be innovative, and that includes the skillful use of analytics. Analytics have slowly crept into NFL front offices in recent years, but the Ravens have been a team reluctant to rely on them. DeCosta implied that he sees analytics in a better light than Newsome did, but will not solely rely on them to make evaluations. The Ravens will use them to a further extent than before, but continue to prioritize traditional methods of scouting and player evaluation. When asked about the most important decision of the offseason, deciding what to do with the star inside linebacker C.J. Mosley, Eric DeCosta said that all options are on the table. That includes using the franchise tag. DeCosta said he believes that good football players should get paid, and as a good football player, Mosley deserves a large contract. That being said, the Ravens will do everything within reason to keep Mosley in Baltimore. Mosley said that he wants to return to Baltimore, Harbaugh said he wants Mosley back, and today, DeCosta reiterated the general position. The Ravens want Mosley back. Eric DeCosta said he was disappointed that rumors circulated that he and Harbaugh did not see eye to eye. DeCosta said that there is no man he would rather work with than coach Harbaugh, and the two are close. DeCosta noted that he and Harbaugh even live in the same neighborhood. He praised Harbaugh for his integrity, humility, and ability to lead a locker room. There has been much speculation over the situation regarding Marshal Yanda and Eric Weddle. Both veterans are set to be on Baltimore’s payroll in 2019, but the Ravens could cut ties with either or both to clear salary cap space, a priority DeCosta outlined as very important in his press conference. Coach Harbaugh said that he expected both veterans to return to the team. Despite his thinking, DeCosta was noncommittal. He said he would bring in the best players for the team that fit financially. The Ravens are not tied to keeping or cutting them, and DeCosta extended that notion for all players on the team. During his long career with the Ravens, Eric DeCosta was constantly sought after by other teams. He consistently received offers to become the general manager of other franchises, but always stayed with the Ravens. Media members asked DeCosta whether he ever came close to taking another job. DeCosta said he sometimes thought about it, but always knew he belonged in Baltimore, and could not turn away from the opportunities the Ravens gave him.